I know it's fun to cut and paste stuff. So here's a texty version. But I also have a lovely version of my resume. I am seeking a lead or senior user experience position in a company that understands why happy and loyal customers are the key to profit, growth and sustainability. With a strong technical background, broad spectrum of expertise and knowledge of industry standards, I can save design cycles and development time in a team of any size. At this time I am only seeking permanent employee status. Owner of the brand, creative director and producer of all collateral. Responsible for the complete user experience, from product strategy through release QA. Metrics-driven product management and UI design for user-facing features, including living styleguide, search results, product pages, account pages and mobile app with measurable success. Qualitative and quantitative user research with three different target audiences: internal, partner and consumer. Co-owner of the user experience, with the VP of Marketing. Qualitative research of existing features and customer requirement gathering for new features. Designed successful Address Book and Greeting Card projects, and designed major product page improvements. Created company's first styleguide document. Worked with creative team and engineering team closely to make the best of a waterfall process. 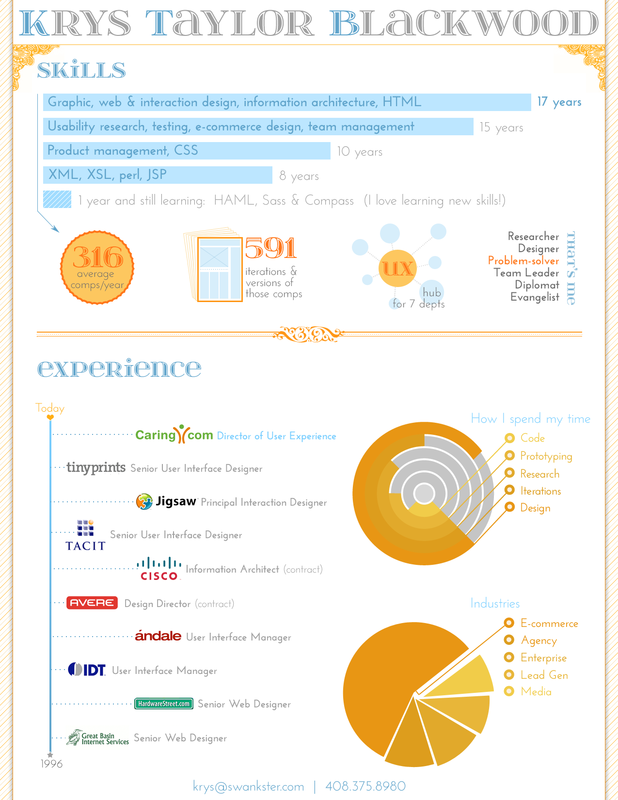 Owned all aspects of online user experience for a complex, web-based application. Redesigned app from four different UI’s to one single, consistent look and feel. Performed customer requirement gathering, usability research and feature validation for all new products, saving development time and improving usability scores. Worked within product team to manage design contractors and collaborate with marketing, engineering and executives on major projects. Simplified every feature in the application, applying progressive disclosure principles to enhance learnability. Applied proper information architecture while redesigning major screens of the app, resulting in increased revenues and user activity. Benchmarked the original UI of a desktop application using usability testing, heuristic evaluation, and baseline review. Built long-term strategy for user interface, emphasizing smooth transitions for the user and manageable development segments. Successfully brought product to beta and initial public release in cooperation with development team, marketing and executives. Provided numerous complete redesigns of the desktop application look and feel, toward three different goals. Remained agile through company direction changes, modifying goals and work plans as needed. Completed initial task - hi-fi prototype of a new ordering tool - in 2 weeks. Estimated time had been 3 months. Created and socialized unified ordering and tracking user interface to replace current function-based tools. Project was adopted. Created complete set of mockups and user interface design specifications for new ordering system, based on user research and iterative testing. Performed baseline usability testing and evaluation on current systems and used the results to refine the new system design. Identified best practices and metrics to be applied to entire organization, resulting in greater awareness of customer needs and feedback. Design and hand-code web-based application prototypes for clients including: QuickStrike, Society SM, RealHouseMusic.com, XAT, Inc., and Prochnow, LLP. XML/XSL hand-coding and graphic design for clients including: Avere, Inc. Spearheaded usability effort for all e-business efforts, including corporate site, intranet and extranet sites. Performed all usability testing and coordinated with third party usability vendors. Formed company as Great Basin's web design department. Responsible for all usability testing and implementation of results. Trained and managed two web design employees and one intern. Managed all aspects of web site creation from customer interface to graphic design and high-level programming, including front and back-end development of web apps. Specialized in Internet hardware and applications, as well as LAN and WAN setup and administration. Provided DOS and MS Windows Technical support over the phone and in office. Repaired and supported personal computer systems with various hardware and software configurations. Built custom computer systems for home and corporate users. IBM's Technology Services Solutions was a partnership with Kodak to provide on-site hardware troubleshooting and repair. I was the youngest field technician ever employed by IBM. Provided hardware service and repair for Packard Bell, Acer, Gateway, Compaq, and IBM AS400 and POS equipment.